Asia Bibi, Pakistani Woman Acquitted Of Blasphemy, Is Freed From Jail Bibi, a Christian who spent eight years on death row before her acquittal earlier this month, was released despite objections from hard-line Muslim groups. 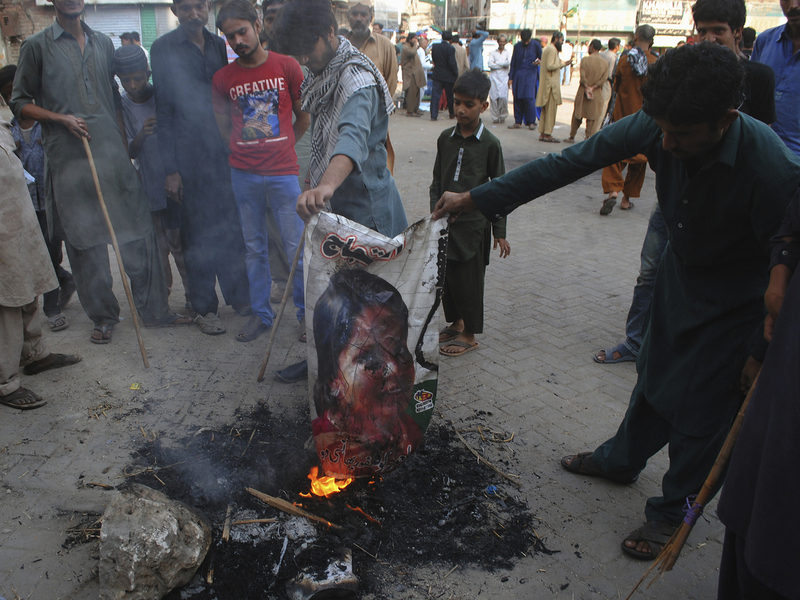 Pakistani protesters earlier this month burn a poster depicting Asia Bibi, who spent eight years on death row on blasphemy charges before being acquitted by Pakistan's Supreme Court. Asia Bibi, a Pakistani Christian woman acquitted days ago of blasphemy, has been freed from jail after spending more than eight years in solitary confinement awaiting execution. The acquittal of Bibi, who is Catholic, was announced just over a week ago by Pakistan's Supreme Court, which said her accusers had not definitively proved her guilt. She was permitted to leave jail immediately after the verdict, but her release was delayed after protests from an extremist religious group, demanding she be killed. Citing officials, the BBC reports that Bibi left her detention facility in Punjab province under heavy security on Wednesday and was flown to a secure location in Islamabad. Bibi was convicted of blasphemy in 2010 and sentenced to death. The conviction stemmed from an argument with her fellow Muslim farm workers. They accused her of being impure by virtue of her faith and claimed she insulted Islam. Her case galvanized the country's religious right and sparked international concern over human rights and religious freedom in Pakistan, which is overwhelmingly Muslim. As her conviction was reversed, "followers of a hard-line Pakistani religious group rushed onto major roads across the country to paralyze traffic in protest of the decision," according to NPR's Islamabad-based correspondent Diaa Hadid. The mobs demanded Bibi, as well as the three Supreme Court judges who acquitted her, be killed. Even in a country which generally tolerates a great deal of hate speech by the religious right, the calls against the army chief, Gen. Qamar Javed Bajwa, seemed to stun many in Pakistan. It led to the prime minister, Imran Khan, warning the protesters in an evening televised address that the state could be forced to act against them. Negotiations began shortly after the prime minister's address to defuse the situation. The Italian government said earlier this week it would help Bibi and her family relocate. Several other Western countries have also offered her asylum. In the past, both Pope Benedict XVI and Pope Francis have advocated for her.